This isn’t the first time I’ve tried a homemade dishwasher detergent. I tried these recipes for homemade dishwasher detergent, but was disappointed by the cloudy residue they tended to leave on glasses and plastic, and the fact that they usually turned hard as a rock. Then I tried extending my dishwasher detergent with baking soda. It worked pretty good, but I just wasn’t real motivated to stick with it. Yup, I was in the process of testing out this recipe when my good ole dishwasher went kaput. We went a couple months washing dishes by hand while Hubby kept saying things like “This isn’t so bad, is it?” or “We don’t need to spend money on a new dishwasher” and “This is just like the good old days!” – and me saying things like . . . I wasn’t even using my words. I was just growling with crabbiness. And so we got a new dishwasher. BUT – then I was a little nervous to try a homemade mixture in my bright shiny new dishwasher. The batch I had been testing out just sat there on the shelf for many months. Until last week. I remembered that this mixture had been working quite well when I was testing it out before and so decided to give it a whirl again. I guess now that several months has gone by the dishwasher doesn’t seem quite so “new” anymore and I was ready to enjoy experimenting again with some homemade mixtures. So how’s it been going? Well, I’ve had nice clean dishes and the dishwasher is still working great. So far, so good! What makes this mixture a little different (and makes it work better) than other homemade dishwasher detergent mixtures is that you add in a product called Lemi Shine It’s a dishwasher additive that helps with hard water and keeps spots from building up on dishes and glasses. It really made a difference and is why this recipe has worked so much better than the others I tried. You don’t even need a rinse aid because the Lemi Shine works much like a rinse aid. The other trick in this recipe that worked great is to leave it out for a couple days and keep stirring it. The other homemade dishwasher detergent recipes that I tried usually turned into one giant rock hard clump that I would finally toss out. The combo of the Lemi-Shine and the stirring for the first couple of days, kept this mixture from turning solid as time went on. Yes, this homemade mixture has finally been a combination that works well in the dishwasher but now I’m wondering, is it worth it? I spent $3.66 for a 12 oz container of Lemi Shine at WalMart. (or you can find it online here = = > Lemi Shine ). This kept my homemade dishwasher detergent from being as frugal as I hoped it would be. And if the point of a homemade dishwasher detergent is to use non-toxic and earth friendly ingredients, well I’m not sure what’s in Lemi Shine and what chemicals it might contain. Nevertheless, I really like how the Lemi Shine works on my dishes. The dishes have a nice smooth clean feel to them. This recipe also makes a pretty good size batch which lasts for a while because you only need a tablespoon per load, and which I think is still cheaper than the store bought dishwasher detergents. So if you’d like to give it a try too, here’s the recipe. 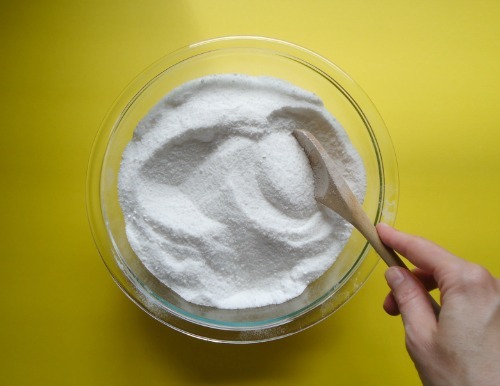 It’s the best homemade dishwasher detergent recipe I’ve tried so far. 1. Combine all ingredients in a large mixing bowl. When everything is first combined it will have a fine powdery texture. 3. Now you have a homemade dishwasher detergent mixture that won’t harden into a solid clump as time goes on, as well as a mixture that doesn’t leave dishes cloudy thanks to the Lemi-Shine. 4. If you want to make the “grainy” mixture a little more powdery again, put it in a food processor and pulse it a few times. I did this so I would have a finer mixture that would pour better from my homemade pour spout for a canning jar. 5. Use about 1 tablespoon per load. As mentioned above, you might find that you have no need for a rinse aid with this recipe as the Lemi Shine works like a rinse aid. If you’ve been using vinegar as a homemade rinse aid, you might be able to skip it with this recipe. Update: When I first made this recipe the weather was warm. When I made a second batch of this recipe, it was cold. Not just ordinary cold, but the polar vortex kind of cold during one of the harshest winters we’ve had in a long time. AND – this recipe did not clump or turn grainy during the waiting period at all! I’m assuming this was because the air in our house was very dry during such cold weather. So after about a week, I quit waiting and went ahead and put some in a jar under my sink as usual. At that point, it did start to clump and get grainy just a little bit, assuming again, that there is more moisture and humidity under a sink than in the spare room where I had the mixture just setting out waiting for it to clump. I just stirred it up in the jar a bit to break up some of the clumps that had started to form. Just wanted to give an update that the weather, heat, and humidity can apparently affect how much this mixture will begin to clump and get grainy during the waiting period. I’m sure someone has already thought of this but could you just put the dishwasher detergent into a silicone mold and make small cube that can be put into the dishwasher adding convenience and solving the clumping problem?? Could you not add boiling water to make it a liquid like the homemade laundry detergent recipe? That would solve the clumping problem. I’m going to try that but not add the lemi-shine but still use my finish rinse aid in the rinse cycle. 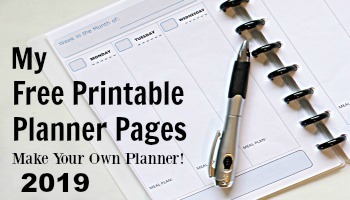 I just tried to make this, but haven’t given it a test run yet. My question is this: I think it smells terrible; do you have any suggestions for making it smell better? I think it’s the Lemi Shine. I thought it would smell like lemon but I think it’s more like cat pee. All of my other homemade soaps are liquid and I add essential oils but obviously that won’t work here. Suggestions welcome! Thanks! Hmmmm – I just went and smelled my mixture again . . . and it does have a “smell” but not anything I find bothersome or like an ammonia “cat pee” smell. Would be interested to hear if anyone else is getting this result. Could it be a reaction to mixing it in a metal mixing bowl? I asked my son to smell it and he said (without my input) that it smells “like a litter box” so something happened. In any case, recommendations for adding a scent would be nice even if we get the cat pee smell resolved. 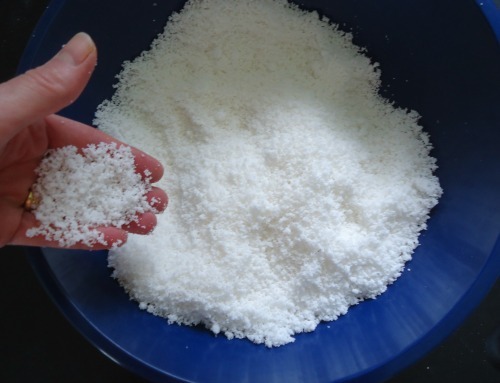 I made your homemade powdered dishwasher detergent and powdered laundry detergent. They have both worked great with one problem, the dishwasher detergent started getting clumpy so I added a bit of regular baking soda. The baking soda being added while trying to make the detergent more fine was great. Although, it has gotten harder since adding the regular baking soda, but it still gets the dishes very clean. However, it would be great if you have any ideas on how I might can get it in a powder form once more and keep it that way. Where do you find Lemi Shine ? I can’t find it. 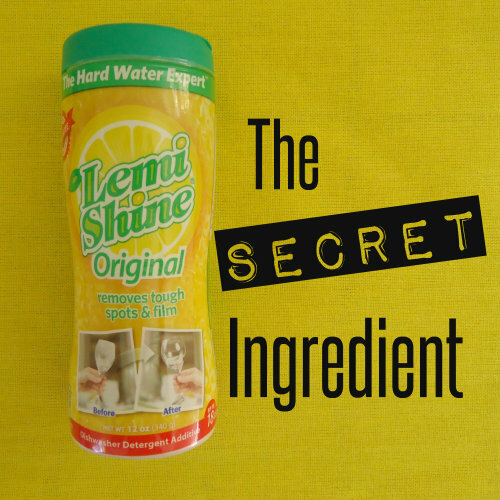 I was able to find Lemi Shine at Walmart and at one of the main grocery store chains in my area (Meijer). It’s sold by the other automatic dishwasher detergents and rinse aids. If you don’t have a Walmart or other large grocery store chain by you, you should be able to order it from Amazon too (but of course then the cost goes up because of shipping). Is the vinegar cleaner for general use safe to use on glass treated with EC10 to reduce staining? I’m not familiar with EC10 or how vinegar might react to it. Perhaps you could try rubbing some vinegar on the underside of the glass and see if there is any reaction. However if you are in doubt, then it’s best to just skip it and stick with a store bought rinse aid.